Designed specifically for the trophy bass seeker, the Zillion brings the classic TD-Z baitcaster into a whole new class of performance. Built for bear, it packs awesome strength and precision into one easy-handling package. With its higher line capacity, rugged 6-point drive train, ''swept'' 3.6'' power crankin' handle and drag star, and Dura-Loc™ pinion, the Zillion can handle just about anything that swims! Its clean, low-profile design incorporates a lightweight aluminum frame and gear side-plate, anatomical contours, and your choice of retrieve speed. Micro-click adjustable Magforce-V spool brake and 8-disc drag; Super Speed Shaft; and 6 stainless ball bearings, plus an Infinite Anti-Reverse™ roller bearing. All the durability a big-bass specialist could ask for! 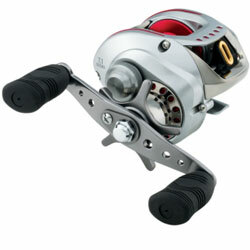 "There is no better reel on the market right now for the price! I have fished with many types of reel including Shimano, Abu Garcia and Pfluger and none of them can even come close to the smoothness of casting and drag of the 100SHA." "I have two 100HAs. These reels are meticulously made. They are built like a swiss watch. They are handsomely finished inside and out. Everything on them is buffed to a super smooth finish." "Daiwa Does it again! Another great reel. It is by far the smoothed reel I've ever used. It casts great, and will even throw small baits. I'd definately buy another!" "This reel is hands down the smoothest, easiest casting reel I've ever owned. It's got the power to fish heavy cover with heavier lines or fish a weightless fluke/swimbait that you can cast forever. You'll be amazed at the quiet smoothness this reel offers."